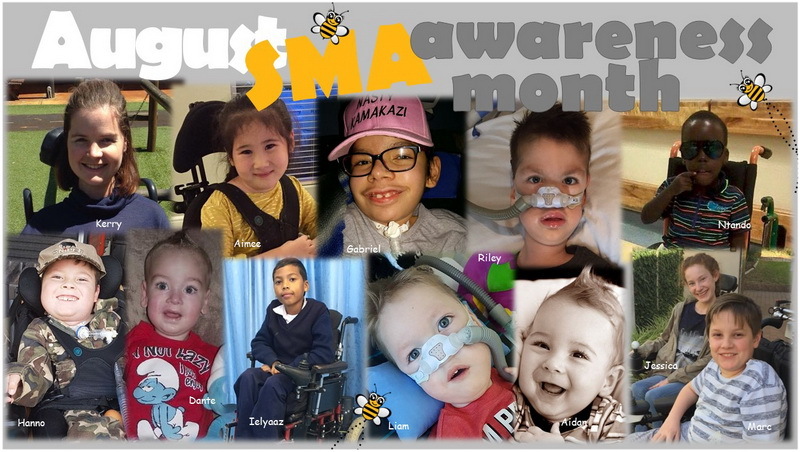 We are paying tribute to all SMA warriors around the world. To our heroes who have lost the battle with SMA and earned their angel wings we will always remember Riley Austin, Aidan Press and Dante Vorster. To our warriors living with SMA, for your courage, strength and zest for life in the face of daily challenges, we salute Hanno, Aimee, Gabriel, Ielyaaz, Ntando, Liam, Kerry, Jessica and Marc. Join us on the 12th of August and light a candle at 8pm in remembrance of all those who earned their angel wings and to honour all young people battling with SMA. Share your photos with us. It is the #1 genetic killer of children under the age of 2. SMA Type 0 and Type 1 are most severely affected by the quickly increasing muscle weakness. Approximately one out of 40 people, carry this gene. SMA does not discriminate, it can affect any race, religion, culture, geographical location or age. On December 23, 2016 the FDA announced that it has approved SpinrazaTM (nusinersen) to treat spinal muscular atrophy, making it the first-ever FDA-approved therapy for SMA. Those being treated with Spinraza have shown amazing improvement. Currently unavailable in South Africa, we are hoping it will be made available and at an affordable cost so that all affected can benefit.